Attorneys attended the first CLE in a the Representing Military Personnel and Veterans Series on Thursday to learn about family law issues affecting our servicemembers. 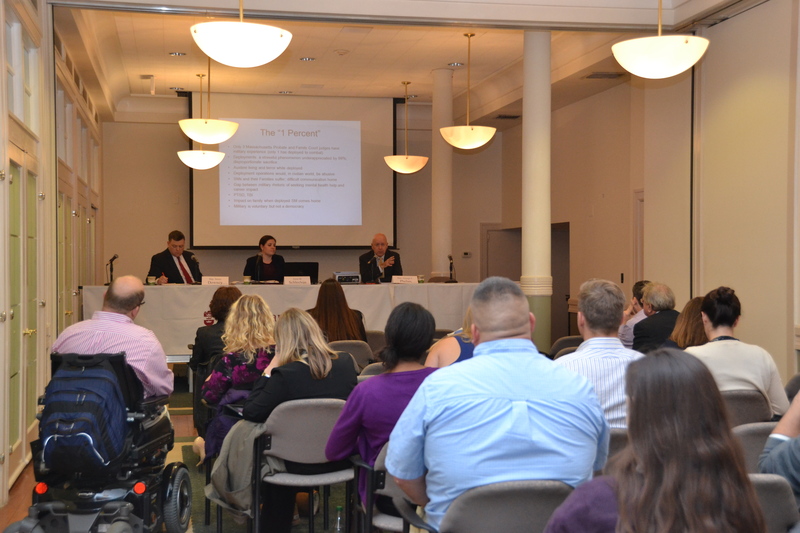 Last Thursday evening, attorneys visited the BBA’s 16 Beacon Street headquarters to hear from an all-star panel on Representing Military Personnel & Veterans in Family Law and Domestic Relations. Topics included unique family law issues that military members and veterans face, such as the Service members Civil Relief Act, jurisdictional issues, and division of military retirement pay. Panelists included: Judge George F. Phelan (Norfolk Probate & Family Court), Anna Schleelein (Shelter Legal Service), and Major James Downey (Massachusetts Department of Veterans’ Services and U.S. Army JAG Corps). 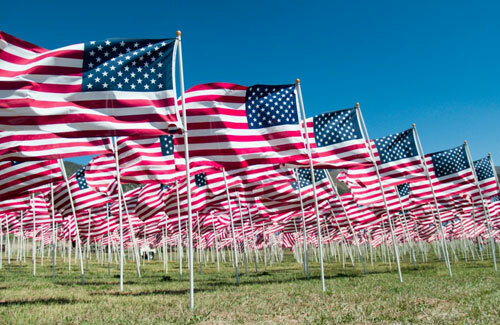 As all of our readers know, the BBA has expanded its commitment to aiding military members, veterans, & their families this year, most recently with the adoption of the Military Legal Help Line by the BBA Lawyer Referral Service, and the aforementioned 4-part CLE series, which will encourage participants to take reduced fee and pro bono cases on behalf of veterans and military personnel. Don’t worry if you couldn’t make the training on Thursday. There are still three more sessions in the series, so you will have plenty of time to get the experience you need to help those who have served, or are currently serving, our country. Next up is the Bankruptcy & Consumer Finance training on October 17th. Check out our brochure for more details. For more information on how to get involved with this initiative please contact Solana Goss, LRS Intake Coordinator, at sgoss@bostonbar.org. BDL Volunteer Coordinator Sarah Amaral spoke with BBA volunteers about the organization and key tips for being an effective volunteer judge. On Tuesday evening, attorneys came to 16 Beacon Street to get the low down on volunteering as a judge for the Boston Debate League (BDL). The BDL has drastically expanded its reach over the last few years, so the demand for qualified volunteers to judge Boston Public High School debaters is at an all-time high. By acting as a volunteer judge at monthly tournaments the BDL, you can make a significant impact on a high school student’s future. Check out this stat from BDL: nearly 100% of students who participate in an urban debate league graduate from high school and more than 80% graduate from a four-year college. Even if you couldn’t make the training on Tuesday, BDL is looking for volunteer judges for an upcoming tournament on October 18th and 19th. For more information on how to get involved in the Boston Debate League, please contact Katie D’Angelo, Public Service Programs Coordinator, at kdangelo@bostonbar.org. Liberty Mutual’s Law Department takes pro bono cases through the Lawyer for the Day in the Boston Housing Court Program. At Liberty Mutual’s Law Department, engaging in pro bono activity is a way of life. More than 50 attorneys in the legal department take part in pro bono work in areas including housing, unemployment compensation, social security, and domestic violence. That’s just one of the many reasons they will be honored with the Thurgood Marshall Award at the BBA’s Annual Meeting this Friday. Specifically, Liberty Mutual has shown commitment to many of the BBA’s public service and pro bono initiatives. 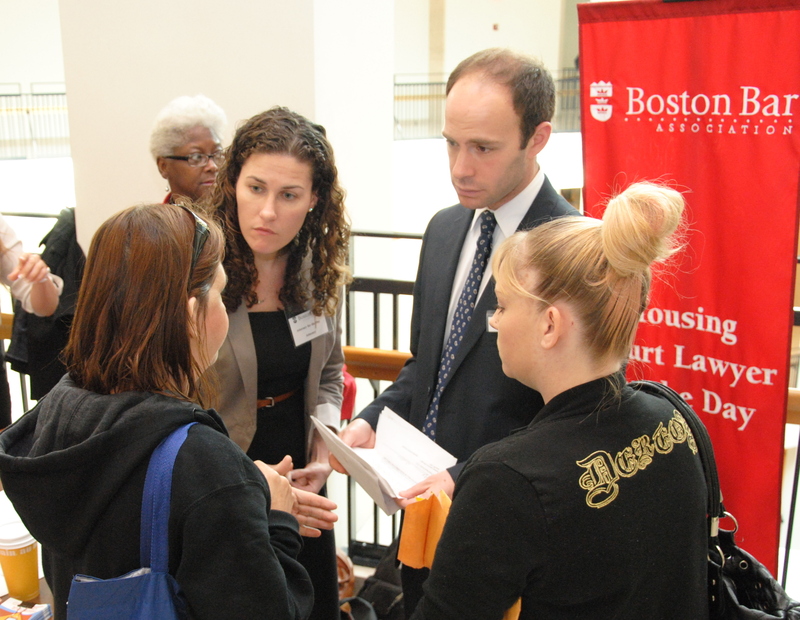 This year alone, their attorneys accepted pro bono cases through the Lawyer for the Day in the Boston Housing Court Program, helping the program assist over 1,100 landlords and tenants. When the M. Ellen Carpenter Financial Literacy Program more than doubled in size last year, the legal department stepped up to the plate and adopted a classroom at Boston Community Leadership Academy. To learn more about Liberty Mutual legal department’s commitment to pro bono work, please click here. 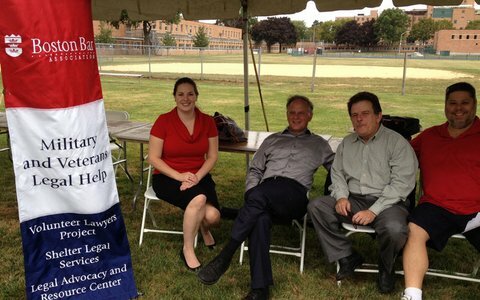 Volunteer attorneys provided legal assistance to veterans at the Boston Veteran’s Expo on Saturday. This Saturday, Shelter Legal Services and BBA volunteers offered veterans legal assistance at the Boston Veterans’ Expo. The event brought together health care providers, social service agencies, legal professionals, and potential employers to allow veterans to access their services at one time. As you may remember, volunteers participated in a similar event in August. Please stay tuned for more updates on the BBA’s veterans initiatives. The BBA will be presenting Jay McManus, the Director of the Children’s Law Center of Massachusetts (CLCM), with the John G. Books Legal Service Award at the Annual Meeting Luncheon this Friday. Jay epitomizes the public service-focused attorney that Beyond the Billable admires. Since 1999, Jay has served as a director of CLCM where he represented children on a number of issues, ranging from abuse and neglect to immigration concerns. The Boston Bar Foundation (BBF) began working with Jay in the same year when CLCM received a grant for its EdLaw Project. Under Jay’s leadership, attorneys work to ensure that Boston’s highest risk children receive a quality education by advocating for students in the school systems. The BBF has continued to support this initiative since 1999. Click here to learn more about Jay and his commitment to assisting children. 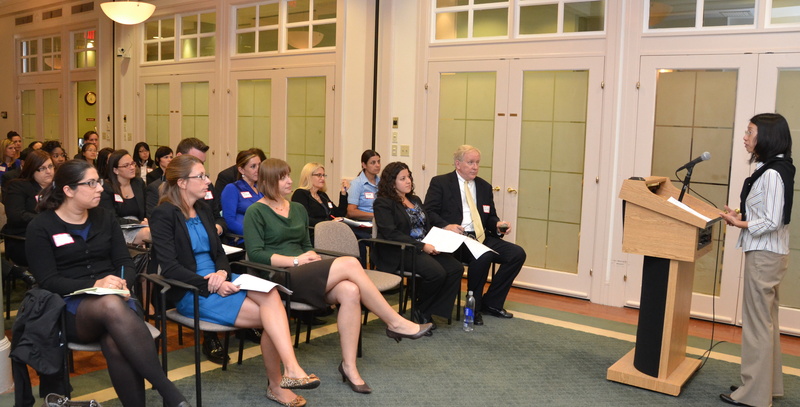 Interested attorneys attended an information session on the Group Mentoring Program at the BBA last night. Last night, the BBA welcomed over 50 new lawyers to its headquarters to learn more about the Diversity & Inclusion Section’s Group Mentoring Program. 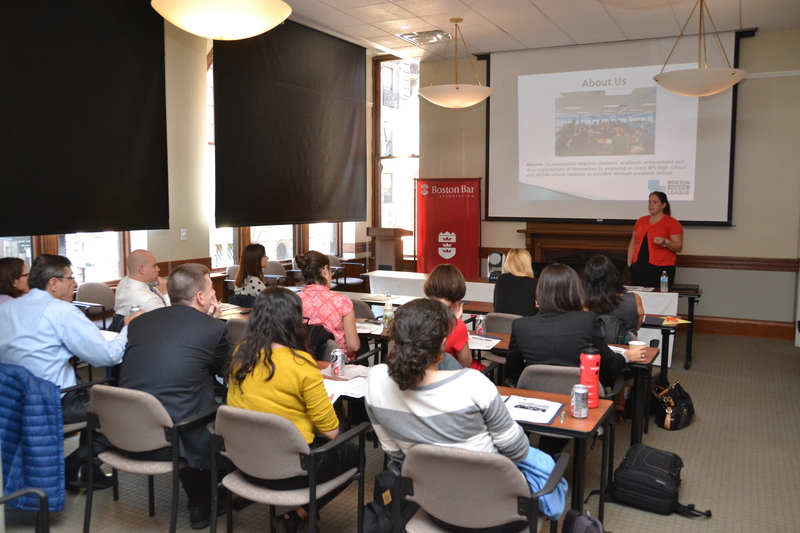 The meeting gave interested participants an overview of the program and introduced them to the program co-chairs, past participants, and BBA staff. After the program wrapped up, mentees submitted application forms and mingled at a networking reception. Mentee applications will be accepted through Friday, September 27th 2013. The program consists of several mentoring groups about 8 new lawyer mentees and 2 mentors who meet monthly for discussions about career paths, work life balance and professional challenges and participants also gather for program-wide seminars and networking events at the BBA. The Mentoring Committee will be launching the new mentoring groups next month. More information on the program and the application form are available here. Contact Susan Helm at shelm@bostonbar.org with questions. Since former BBA President Jack Regan (WilmerHale) made supporting veterans, military personnel and their families his presidential priority in 2010, the BBA’s commitment to helping this population has been at the forefront of our public service initiatives. In the past few months alone, the BBA increased access to legal assistance through the BBA Lawyer Referral Service’s Military Legal Help Line, developed a CLE training series on Representing Military Personnel and Veterans, and had a presence at Yellow Ribbon events. Of course, we couldn’t do it alone. Our efforts have been aided enormously by our dedicated volunteers and key community partners. Our Active Duty, Family Members & Veterans Committee of the BBA Delivery of Legal Service Section overseas these initiatives and works with legal services organizations. The two Co-Chairs, Lynn Girton (Volunteer Lawyers Project of the Boston Bar Association) and Anna Schleelein (Shelter Legal Services Foundation), help ensure that veterans, military personnel and their families have access to quality legal assistance. 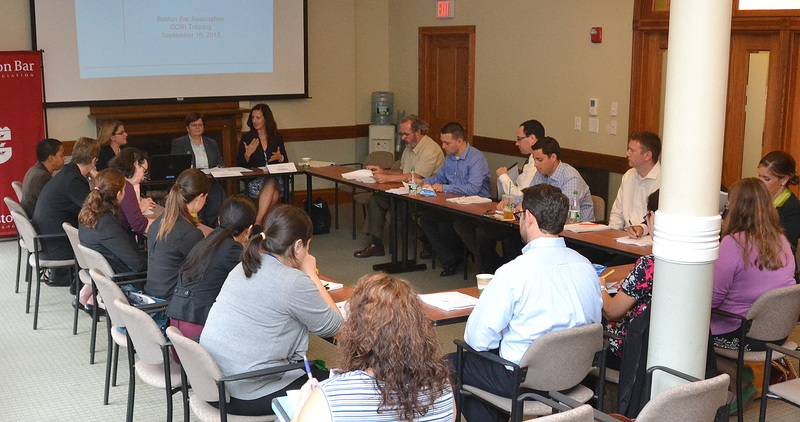 Attorneys learned how to seal criminal records at last night’s pro bono training at the BBA. Last night, attorneys packed into the Claflin Center to attend the annual Criminal Offender Record Information(CORI) training, a free, pro bono training run in collaboration with Greater Boston Legal Services. Agapi Koulouris (Department of Criminal Justice Information Services), Christina Miller (Suffolk County District Attorney’s Office), and Pauline Quirion (Greater Boston Legal Services) trained attorney to help clients from Roxbury, Dorchester and other low-income Boston Communities to seal their criminal records and break the cycle of poverty and unemployment. In exchange for attending this free training, participants are encouraged to take a pro bono case, staff the CORI help table at the Roxbury Court, or help with a community education event in Roxbury and other Boston locations to educate low income individual about their rights to seal their records. To learn more about the BBA’s Public Service work, click here. The current PILP class met with Chief Magistrate Judge Sorokin and Magistrate Judge Hennessy from the U.S. District Court for the District of Massachusetts on Tuesday to learn more about the CARE/RESTART Program and to gain career advice. 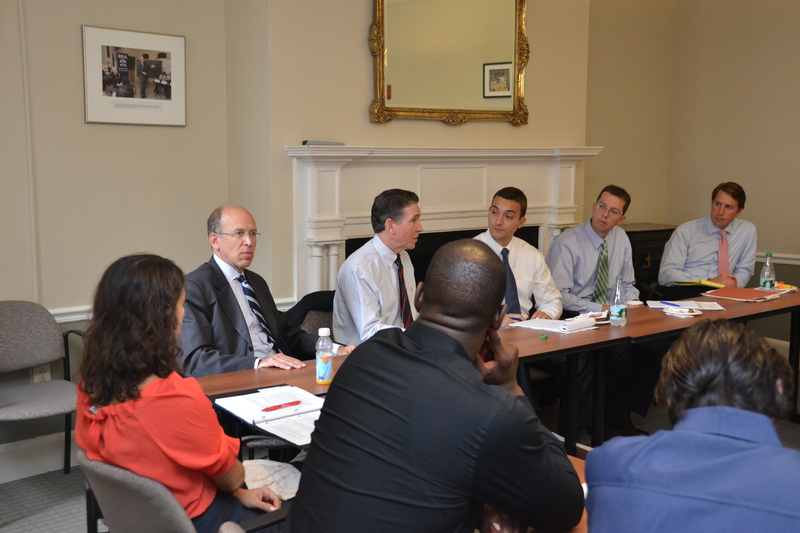 On Tuesday, the BBA’s Public Interest Leaders met with Chief Magistrate Judge Sorokin and Magistrate Judge Hennessy from the U.S. District Court for the District of Massachusetts. Judges Sorokin and Hennessy shared insight about their careers, offered tips on leadership, and discussed the Court Assisted Recovery Effort (“CARE”) and the Reentry: Empowering Successful Todays and Responsible Tomorrows (“RESTART”) programs which they oversee. As our readers know, members of PILP9 have been working closely with these programs over the past year to execute the Community Reentry Readiness pilot program. In the upcoming months, PILP10 will be synthesizing the insight that they have received from various leaders in the profession in order to construct and execute their own public service initiative. Stay tuned as updates on PILP programming unfold. 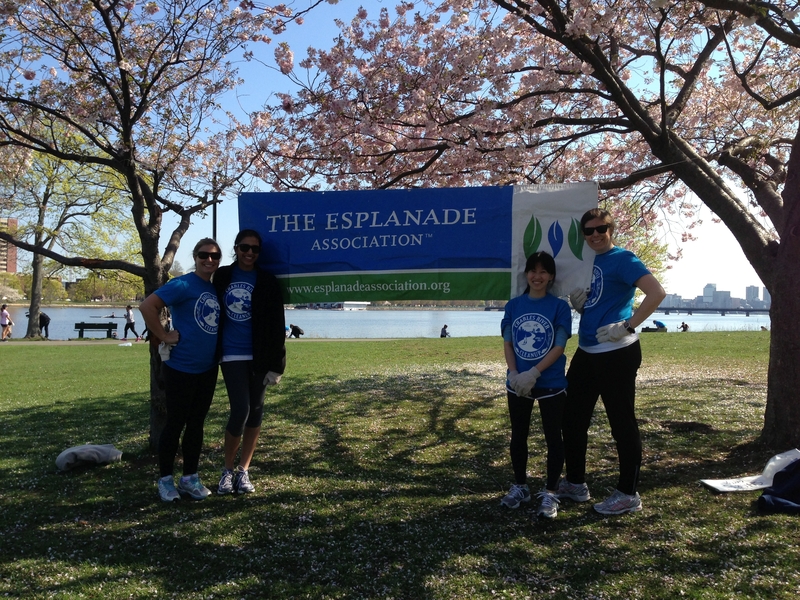 The Charles River Clean Up is one of the many volunteer opportunities that the New Lawyers Public Service Committee has planned for the upcoming year. Last night, law students, young attorneys, and recent graduates awaiting bar results gathered at 16 Beacon to learn how to get more involved in public service activities across Greater Boston. The meeting/information session allowed participants to meet the New Lawyers Public Service Committee Co-Chairs, Sara Farnum (Massachusetts Office of the Attorney General ) and Margaret Caulfield (Partners HealthCare), learn more about the New Lawyer’s public service calendar of events for the year, and ask questions about opportunities to gain more legal experience through pro bono work. Check back for more information on the events throughout the year.